Hennessey’s Tavern, located at 7811 Herschel Avenue, would like a Sidewalk Cafe similar to other restaurants in the La Jolla community. We are proposing to construct a 180 square foot Sidewalk Cafe located within the public walkway in front of their existing restaurant. Our Sidewalk Cafe is proposed to encroach into the public walkway by 6 feet in width with a proposed 3 foot high wrought iron railing. The patio would run the length of the front of the existing restaurant approximately 48 feet Our proposed Sidewalk Cafe would be very similar to the resturant patios of Aroma Bakery, Coffee Cup, Burger Lounge, Resturant 910 and the other many sidewalk cafes in our beautiful village. As required by the San Diego Municipal Code and the La Jolla PDO the proposed patio would maintain an existing clear sidewalk path of a minimum of 8 feet. During the project review process, with the City of San Diego building department, modifications were made to bring the proposal into conformance with all of the development regulations for a Sidewalk Cafe, pursuant to Land Development Code Section 141.0621, the applicable sections of the La Jolla Planned District Ordinance and the San Diego Municipal Code. The La Jolla Community Planning Association (LJCPA), however is opposed to our Sidewalk Cafe. 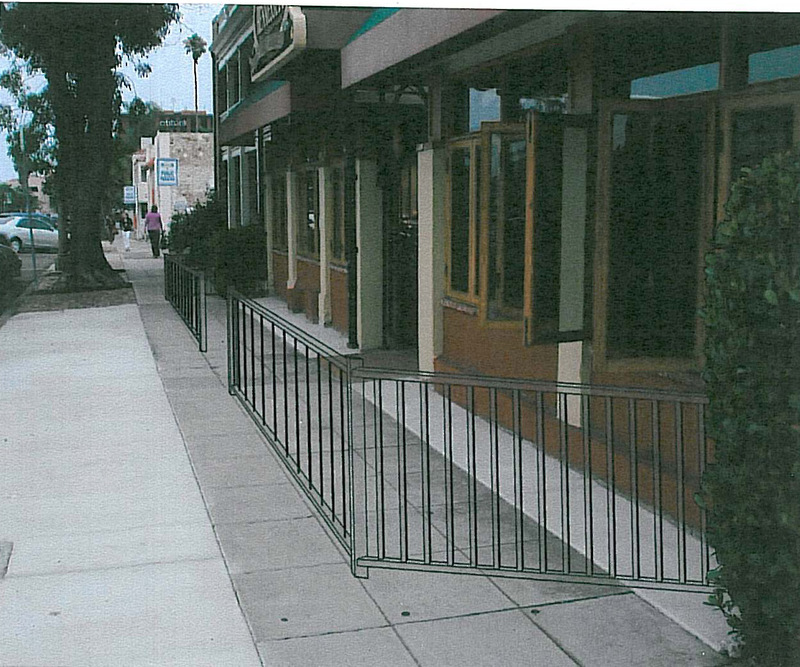 On December 5, 2011 San Diego City staff issued a Notice of Decision approving the Sidewalk Cafe. On December 16, 2011 the LJCPA appealed the City of San Diego’s decision to the San Diego Planning Commission. The LJCPA cited several reasons for their appeal including; (i) The patio does not meet the general purpose and intent of the La Jolla Planning District Ordinance and will not function as proposed in protecting public health saftey and welfare and (ii) It would impede handicap access. Below is a photo simulation of the Henessey’s proposed patio. The final approval of our patio will be heard by the San Diego Planning Commission on March 16, 2012. Sound reason prevailed on March 16th, 2012 when the San Diego Planning Commission voted unanimously to approve Hennessey’s sidewalk cafe. This approval was granted despite the objections raised by Trustees Phil Merten and Mike Costello, notwithstanding, it had been previously approved by a LJCPA subcommittee. Marengo Morton Architects, Inc. felt the rights of Hennessey’s to have a sidewalk cafe were being improperly denied by the LJCPA. They supported the business owner by providing their services pro-bono. Had this business not had an advocate for fairness and reason, they would have continued to spend thousands of dollars to process a simple permit. The two LJCPA appeals against the project cost the business owner in excess of $10,000.00. My question is; Why does our community group continue to deliberately interfere with the rights of property owners and businesses knowing that the La Jolla Village thrives on a people oriented atmosphere?